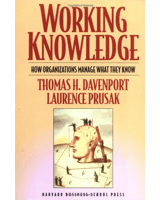 This book was the first, and a best selling book, on knowledge management. It describes the key issues to address in managing knowledge, from implementing knowledge technologies to creating knowledge markets. There are many examples of leading practice. 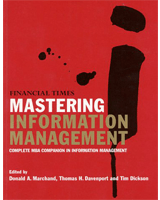 Davenport and Marchand edited this book of short pieces by many leading authorities on information management. Part of the Financial Times’ “Mastering” series, it contains highly readable and usable lessons on this most important topic. By viewing enterprise systems as business vs. technology projects, discover the specific business change objectives that will enable a smooth ES adoption and implementation. 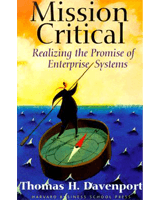 This book takes a no-nonsense view of enterprise-wide information systems, and offers a set of guidelines to help evaluate the benefits, pitfalls – and opportunities and challenges – for your organization. 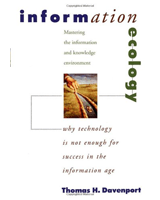 Davenport makes a convincing case that the right perspectives for managing information are not engineering — or technology — based, but rather ecological. He describes organizations that work across multiple fronts to make their information environments more effective. 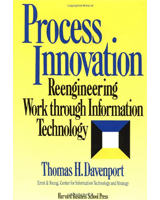 Davenport’s first business book was one of his best-selling, and the first to describe the worldwide phenomenon of business process reengineering. Process Innovation provides detailed information on the topic for readers seeking substance.